Periodontal disease (gum disease) can vary in negative effects, ranging from gum inflammation to major damage of the soft tissue and bone that supports the teeth. Proactive periodontal treatment helps stop or slow the progression of gum disease. If periodontal disease is neglected, or is left untreated, the condition can become worse and teeth may be lost as a result. Periodontal disease can be treated in various ways, these treatments can be broken into two separate categories: non-surgical and surgical. Professional Dental Cleaning: When plaque and tartar are removed from above and below the gum line of all the teeth. 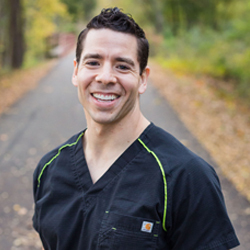 If gum disease is discovered, Dr. Del Toro may recommend a professional cleaning more frequently to help avoid periodontal disease from becoming more severe. Scaling and Root Planing: A deep-cleaning method. Scaling is when plaque and tartar are scraped away from above and below the gum line. Planing is then performed by removing the rough sections of the tooth root through leveling or smoothing out these areas. This process removes bacteria and provides a clean surface for the gums to reattach to the teeth. Flap and Pocket Reduction Surgery: The gums are lifted away to remove the tartar. Any damaged bone may be smoothed in order to limit areas where bacteria can build up and hide. The gums are then placed tightly around the tooth. Guided Tissue Regeneration: If the bone that supports the teeth has been destroyed due to periodontal disease, this procedure is done to stimulate the bone and gum tissue to grow. This is done in combination with flap surgery. A small piece of mesh-like fabric is also inserted between the bone and gum tissue. Bone Grafts: Fragments of bone or synthetic bone are used to replace bone that was destroyed by periodontal disease. The grafts help encourage bone regrowth, which leads to more stability for the teeth. Soft Tissue Grafts: Grafted donor tissue, so as to keep the patient as comfortable as possible, is used to reinforce thin gums or to fill in places where gums have receded. The tissue is stitched into place. Bone Surgery: Craters in the bone are leveled. These craters form from moderate to advanced bone loss. After flap surgery is performed, the bone surrounding the tooth may be reshaped in order to decrease the craters so that bacteria does not collect in the pockets and grow. Non-surgical treatment is typically used as a first resort to treating periodontal disease. Scaling and root planing is frequently all that is needed for periodontal treatment. Surgery is recommended when the tissue around the teeth becomes unhealthy and cannot be repaired non-surgical treaments. If you have any questions or to learn more about our periodontal treatments, please contact our Paris, TX dental office.